So you love Spain and so do the kids. You go there year after year because you love the great climate and you can’t beat it as a cheap or all inclusive holiday destination. The only trouble is this year you can’t decide where to spend your well earned break. Should it be buzzing Benidorm or the beautiful Balearic Island of Majorca? Obviously there are many things to consider but they are both great for beaches and seaside fun. They also have pretty fantastic theme parks to excite the kids as well. 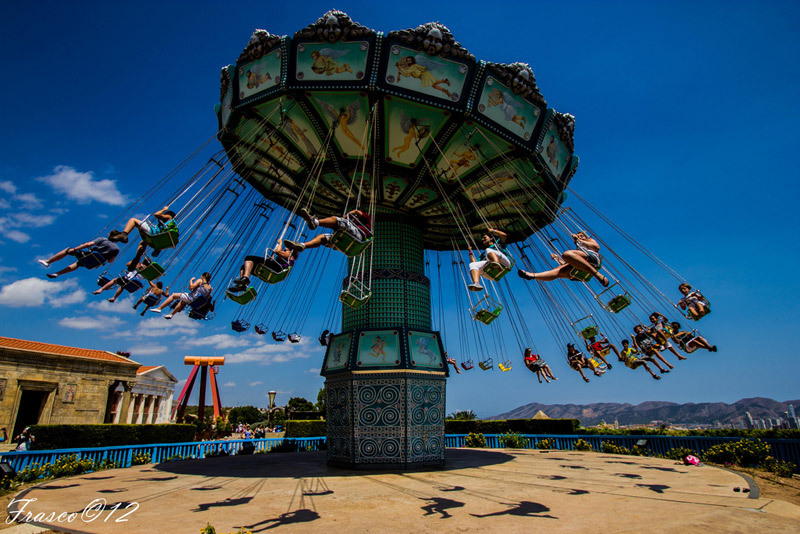 Hold on tight as you enter Terra Mitica which showcases the Mediterranean cultures of Greece, Italy and Egypt with its themed rides and attractions. It’s definitely ‘scream if you want to go faster’ on the 60 mph looping Titánide roller coaster and the equally hair-raising Inferno ride. Stomach-lurching is promised on the 54 metre free-falling Flight of the Phöenix and the terrifying Synkope. Calmer rides that are suitable for the little ones include the Mithos carousel, the Akuatiti water ride and the Alucinakis train ride. There are too many other thrilling rides to mention here, so you’ll just have to visit for yourself. But we will let you into a secret or two: you’ll also find a 5D cinema in Kinetos´s Temple, over 20 entertaining shows which are performed daily, as well as restaurants and souvenir shops. Katmandu Park is a crazy place full of imaginative and interactive attractions. If you’ve ever visited WonderWorks in Orlando you’ll love Katmandu Park’s upside down house. Inside you’ll discover a musical enchanted forest, an ice cave and hurricane force winds to blow your socks off. The kids will love the Desperados attraction which is described as ‘no ordinary rodeo’ and the 4D cinema complete with seats to simulate different ride options. There’s also Expedition Golf offering a twist on miniature golf and The Asylum aimed at adults. Tequila Ville is where you’ll find Mexican cuisine and refreshments for refuelling when on your Majorca holidays. What do you mean this hasn’t made your decision any easier. Ah well there’s nothing for it, you’ll just have to visit Spain again in 2014. Next articleRoyal Caribbean: Why Not? Benidorm is one of the funniest cities in Spain, and the route from Benidorm to Denia, is one of the most interesting in Spain.